Brittany Ratcliffe spoiled the Courage’s 12-game unbeaten streak on Saturday night scoring in the 94th minute to earn Utah Royals FC a 1-0 win on the road. Ratcliffe entered the game in the 77th minute and in the 94th minute Utah Royals FC midfielder Diana Matheson took a free kick from far out that created a 50/50 scramble just outside the box. Ratcliffe battled with the Courage’s backline to win the ball and managed to not only win it, but turn and shoot into the upper left corner for the game-winner. This is Ratcliffe’s second goal of the year. The Courage’s 12-game unbeaten streak was snapped on Saturday night, however they still hold on to first place in the league standings at 9-1-3 and 30 points. Utah Royals FC improve to 4-2-5 with the three points. Utah Royals FC has only recorded one loss in their last eight games. The first half didn’t see many opportunities for either side, with North Carolina’s best chance coming from forward Crystal Dunn in the 32nd minute. Midfielder McCall Zerboni combined for a one-two play just outside the box and Dunn was able to get a right-footed shot off, but Utah Royals FC goalkeeper Abby Smith came out with the save to keep it scoreless. At the break both teams had five total shots. The final shooting breakdown was Courage 15 shots, Utah Royals FC eight shots. Dunn finished the game with a team-high four shots. Dunn also had the best passing accuracy for her side according to Opta with 82.1% in 28 passes. Zerboni was key in the midfield for the Courage making seven tackles, two clearances and four interceptions. For Utah, the best attacking chances came from forward Katrina Gorry and Katie Stengel. Gorry finished the game with three shots and Stengel made three key passes in the win. Defensively, Becky Sauerbrunn held it down for her side making five tackles, 14 clearances and six interceptions on the day. In the 69th minute the Courage had a chance to get ahead when Debinha served a dangerous ball into the box. Courage midfielder Denise O’Sullivan got a foot on it but her shot hit the crossbar. In the final minute a loose ball in the box found the foot of Courage defender Merritt Mathias but her shot went just over. Courage goalkeeper Katelyn Rowland picked up the loss in net with two saves on the night, and Smith earned the win for her side with four saves. The Courage will travel to Seattle Reign FC on June 23 and Utah Royals FC will head into Week 13 ready to face the Chicago Red Stars on the road on June 23. Match ends, North Carolina Courage 0, Utah Royals 1. Second Half ends, North Carolina Courage 0, Utah Royals 1. Attempt missed. Merritt Mathias (North Carolina Courage) right footed shot from the centre of the box is just a bit too high. Goal! 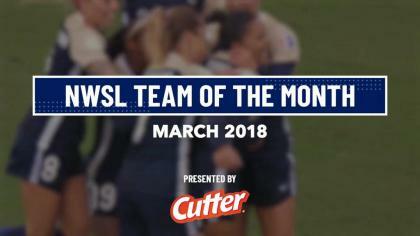 North Carolina Courage 0, Utah Royals 1. Brittany Ratcliffe (Utah Royals) right footed shot from outside the box to the top left corner following a set piece situation. Attempt blocked. Abby Erceg (North Carolina Courage) header from very close range is blocked. Assisted by Samantha Mewis with a cross. Corner, North Carolina Courage. Conceded by Katie Bowen. Substitution, Utah Royals. Elise Thorsnes replaces Amy Rodriguez. Substitution, Utah Royals. Brittany Ratcliffe replaces Katrina-Lee Gorry. Rebecca Moros (Utah Royals) wins a free kick on the left wing. Offside, Utah Royals. Becky Sauerbrunn tries a through ball, but Amy Rodriguez is caught offside. Substitution, North Carolina Courage. Lynn Williams replaces Jessica McDonald. Offside, North Carolina Courage. Abby Erceg tries a through ball, but Jessica McDonald is caught offside. Denise O'Sullivan (North Carolina Courage) hits the bar with a right footed shot from the centre of the box. Assisted by Debinha. Substitution, Utah Royals. Lo'eau LaBonta replaces Katie Stengel. Corner, North Carolina Courage. Conceded by Becky Sauerbrunn. Attempt missed. Diana Matheson (Utah Royals) right footed shot from outside the box is close, but misses to the right. Assisted by Amy Rodriguez. Crystal Dunn (North Carolina Courage) hits the bar with a left footed shot from the right side of the box. Assisted by Jaelene Hinkle following a corner. Corner, North Carolina Courage. Conceded by Rachel Corsie. Attempt saved. Merritt Mathias (North Carolina Courage) left footed shot from outside the box is saved in the centre of the goal. Assisted by Samantha Mewis. Substitution, North Carolina Courage. Denise O'Sullivan replaces Kristen Hamilton. Attempt saved. Katrina-Lee Gorry (Utah Royals) right footed shot from the right side of the box is saved in the bottom right corner. Assisted by Diana Matheson. Attempt missed. Crystal Dunn (North Carolina Courage) right footed shot from outside the box is too high. Assisted by Samantha Mewis. Attempt missed. Samantha Mewis (North Carolina Courage) right footed shot from outside the box misses to the right. Assisted by Debinha. Attempt saved. Jessica McDonald (North Carolina Courage) header from the centre of the box is saved in the top centre of the goal. Assisted by Jaelene Hinkle with a cross. Attempt blocked. Debinha (North Carolina Courage) right footed shot from the centre of the box is blocked. Attempt blocked. 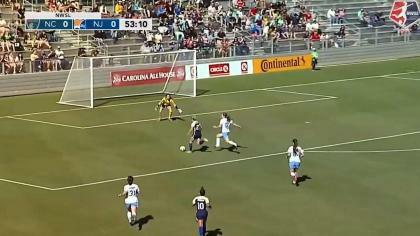 Kristen Hamilton (North Carolina Courage) right footed shot from the centre of the box is blocked. Second Half begins North Carolina Courage 0, Utah Royals 0. First Half ends, North Carolina Courage 0, Utah Royals 0. Foul by Kaleigh Kurtz (North Carolina Courage). Attempt saved. Jessica McDonald (North Carolina Courage) header from the centre of the box is saved in the top centre of the goal. Assisted by Crystal Dunn with a cross. Offside, Utah Royals. Rebecca Moros tries a through ball, but Katie Stengel is caught offside. Attempt missed. Katrina-Lee Gorry (Utah Royals) right footed shot from outside the box is just a bit too high. Attempt missed. Amy Rodriguez (Utah Royals) right footed shot from outside the box is too high. Assisted by Katie Stengel with a headed pass following a set piece situation. Offside, North Carolina Courage. Samantha Mewis tries a through ball, but Kristen Hamilton is caught offside. Attempt saved. Crystal Dunn (North Carolina Courage) right footed shot from the right side of the box is saved in the bottom left corner. Assisted by McCall Zerboni. Corner, Utah Royals. Conceded by Abby Erceg. Desiree Scott (Utah Royals) is shown the yellow card for a bad foul. Offside, Utah Royals. Katie Bowen tries a through ball, but Gunnhildur Yrsa Jonsdottir is caught offside. Attempt saved. Amy Rodriguez (Utah Royals) left footed shot from outside the box is saved in the bottom right corner. Assisted by Katie Stengel. Offside, Utah Royals. Abby Smith tries a through ball, but Amy Rodriguez is caught offside. Attempt missed. Crystal Dunn (North Carolina Courage) right footed shot from the centre of the box is high and wide to the right. Attempt missed. Katrina-Lee Gorry (Utah Royals) right footed shot from outside the box misses to the left. Assisted by Gunnhildur Yrsa Jonsdottir. Attempt missed. Jessica McDonald (North Carolina Courage) header from the centre of the box misses to the left. Assisted by Jaelene Hinkle with a cross. Diana Matheson (Utah Royals) wins a free kick in the defensive half. Attempt missed. Samantha Mewis (North Carolina Courage) left footed shot from the centre of the box is too high. Assisted by Jaelene Hinkle with a cross following a corner.